Educational Qualification :- Candidates should have passed Bachelor’s Degree in any stream from a recognised university. Application Fee :- General/UR/OBC candidates have to pay Rs. 600 and SC/ST candidates have to pay Rs. 100 through online mode using Net-banking/Credit or Debit Card. 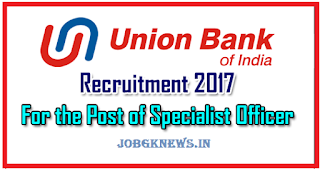 How to Apply Union Bank of India Job Vacancy :- Interested and eligible candidates may apply online through Union Bank of India website - https://www.unionbankofindia.co.in/ - from 04-10-2017 to 21-10-2017.